As most of you know, I live in a Townhouse. We moved from an apartment to a Townhouse almost 2 years ago (Same complex). One of the main reasons was space. Our apartment was small. Two bedrooms, One bathroom, 900 square feet. Our Townhouse isn't much bigger but we have two floors, two bedrooms, 1.5 bathrooms, 1,081 square feet, and a backyard. Decorating came easy with the help of my in-law but my bathroom was something I wanted to decorate myself. My mom always says "there should be at least one green room in your house, for luck." I decided my one green room would be my bathroom. With the help of pinterest, my fiance and of course my opinionated seven year old. Our bathroom was decorated. Since we rent a Townhouse my fiance and I decided we wouldn't replace anything big, unless nessary. If I could replace one thing it would be my bathroom faucet. I'm not a big fan of the faucet installed in our bathroom. It's plain jane. I would love a beautiful new bathroom faucet from Danze. Their bathroom faucets are absoutely stunning. Don't believe me? Check out this faucet I have my eyes on HERE. There is NOTHING plain jane about their Two Handle Centerset Lavatory Faucet. It's perfetly priced and would look even better in my bathroom. They even have a matching Single Handle Pressure Balance Tub & Shower Faucet!! When I'm ready to rennovate my bathroom, Danze will be my one stop shop. They have a wide range of styles to choose from, be it traditional, contemporary or timeless, and finishes from chrome to tumbled bronze, they live up to the word. But looks aren't everything, are they? Installation, innovation and ease of use are all must haves. Well, you can consider all those boxes checked. They even have a section to help you get inspired. And if you're like me. This will definitly come in handy. For more updates and inspiration please follow Danze on Facebook and Pinterest. DISCLAIMER: All products received are complimentary for testing purposes from Danze and Makobi Scribe. All opinions stated are my own and are not influenced by any affiliates. We have 1 bathroom to go.. once we are ready for that renovation we will check into Danze.. thanks for the tip. My upstairs bathroom is so small and could definitley use a re-do. I am thinking maybe this summer I might pick a color scheme and just go for it. I've never had a green room in my house! Right now, my condo is painted in all neutral colors- tans and beiges. Eventually, my husband and I will be moving and I can't wait to paint and decorate! We just finished re-doing our kitchen and dining room. We have a full bath and a partial bath/utility room to work on next. I'll have to check Danze out for sure! Yes I agree with you, that faucet is very nice. We renovated our entire house 3 years ago, so no more renovations for us for a while! I'd love to do up our bathroom. I posted a bathroom inspiration post last year too but still haven't gotten round to doing anything. Great ideas to redo a bathroom! Thanks for sharing! We rent too and I hate that I can't do much. I love that faucet, I have a pretty fancy one in our upstairs bathroom it was redone right before we moved in but our main floor one is retro and updated its awful. A faucet can really make or break the look of a whole bathroom! Our bathroom is green right now too. I had no idea that having a green room was lucky! Oh ym stars those stickers are precious. The Danze faucet is gorgeous and I would love to have one in my bathroom. I visited my son recently and his faucet was falling apart. It's time for him to get a new one for sure! We have a danze kitchen facet. We love it and its such a great brand! I’ve been meaning to redecorate my bathroom, too! Maybe this summer is a good idea. Thanks so much for sharing. I moved into a small apartment this past year even though I own my home. I wanted to downsize because of back injuries and couldn't keep up with a full size home. I gave my home to my daughter and her family and I'm trying to deal with what I thought would be an easy transition. I'm surfing through Danze now to see what bathroom accessories they have because my bathroom is my #1 main problem. Finding small accessories for a small space isn't always easy. Yeah, I am not a fan of that faucet style either. 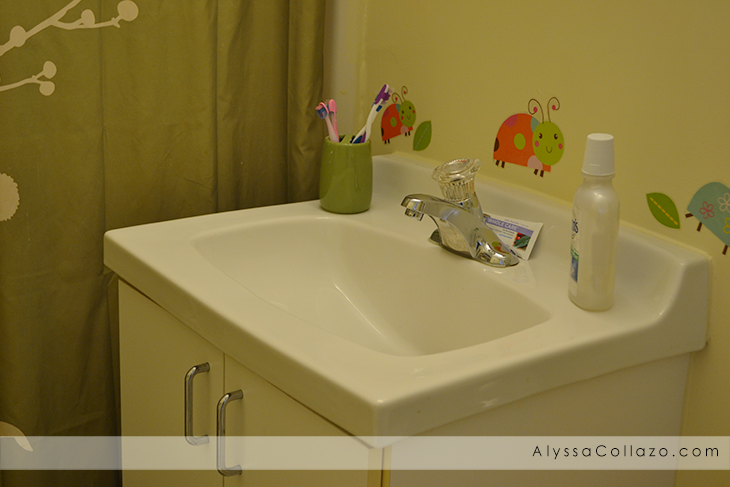 Often small update like a faucet can really update a room. very nice - it is often the small changes like a new faucet that make a big difference! We need a new faucet in our kitchen. Ours is leaking a bit, but I've never done one. I'm nervous to replace it, but I'm going to give it a go. It can be really hard to decorate when renting, that is why I love wall decals! I grew up in apartments and now I can't stand sterile white walls. Thankfully, I've been living in houses for many years now. We did a bathroom reno a few years ago. It was pretty fun as we did a lot of the work ourself. We hope to be moving soon to be closer to the city and hubs job. I really want to buy an older house that I can renovate things to make them my own. So much cheaper to buy a house that way then to buy one with things you already want. We don't have Danze in the UK, but I have a bathroom in dire need of a new suite. It's so expensive here. I love decorating my house! It's so fun to pick furniture out and decide on where you want it to go! Don't think we have a Danze in the UK! What a beautiful bathroom, we are renting so I don't get to have fun making over my bathroom! I can totally relate. I have an apartment and I'm about to run out of room. It's 2 bedroom and 2 bath's, but still a little small since I'm a Girl Scout Leader. I love going to overstock.com; they have cute faucet's and it's affordable. We have one small bathroom. We are trying to figure out what we want to do with it to make it nicer. I need some bathroom inspiration myself as well. I want it to look better.. and prettier kind of feel than how it was now. I would love to re-do my bathroom. I can not wait till the day comes when I can. I re-do my bathroom by just changing out the decor. It's so small, it doesn't take much. New (or different) wall hangings, shower curtain, towels, soap dispenser, etc. I've even purchased things from garage sales before and had fun with them. I went to the Danze faucet site, I love the industrial looking kitchen faucet! I'm looking at redoing my kitchen and the kids bathroom...ahhh so much to do. :) I can't wait to see what you do to your space! I had never heard of Danze before this post. Sounds like a great place to go for ideas! Thanks for sharing. I really like your faucets design it’s looking classic. I think designer faucets and bathtubs are the main things that help you to make your bath area perfect as you want.